What's up in May at Flavor? — Flavor Creative Catering Ltd.
Our Sandwich of the month of May at Flavor Downtown is the Keep S'myelin" in support of Multiple Sclerosis Awareness. A delicious grilled chicken with pesto mayo topped with sun dried tomato, salad greens and mozzarella cheese, served on a toasted ciabatta roll! $2 for the sale of each sandwich will go towards the MS Society of Canada. Come join us on Sunday, May 27, for the MS Society Walk at The Joan Harris Cruise Pavilion! The May Music Line-Up For Flavor On The Water. During the Month of May Flavor On The Water hosts a variety of some of Cape Breton's best musical talent. Every Friday evening and Saturday evening. Stop in and enjoy some tunes with Keith Mullins, Flo Sampson, Brandon Collier, and Chuck & James! Don't forget about your Mom! Mother's Day is just around the corner and we have exactly what you need to make your Mother feel as special as she deserves to feel! 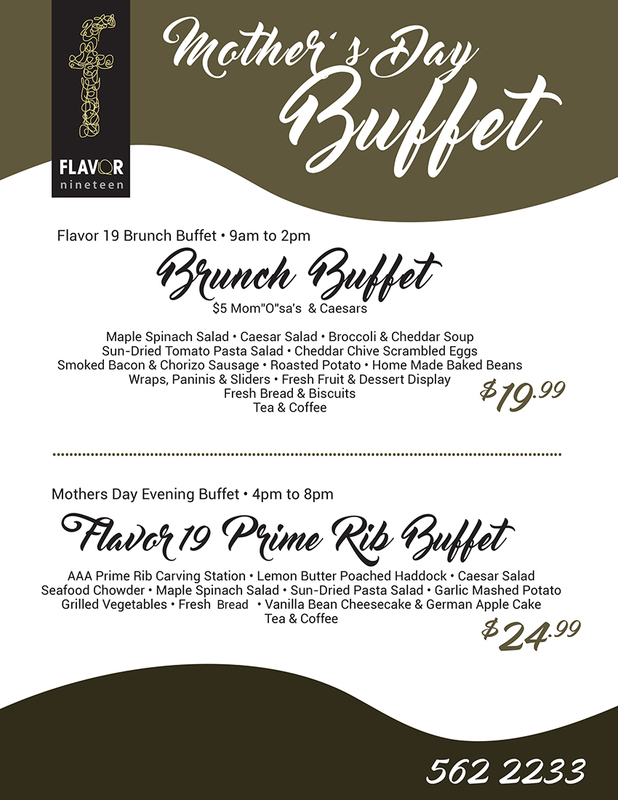 Flavor 19 and Flavor On The Water Mother's Day Menus are below! YES! During the Friday Night Back Lounge After Work Party we have Happy Hour Specials ALL NIGHT! If you haven't stopped into the Back Lounge After Work Party yet, now is the time! Every Friday beginning at 4pm the party starts. Live music until close, Happy Hour Specials ALL NIGHT, Buckets of Beer, Five Dollar glasses of wine and everyones favourite....BOGO 50% OFF APPS!